Facebook today acknowledged its awareness of an issue raised by a few iOS users last week, who saw large amounts of battery drain on their iPhones while the social networking app ran in the background, even with background app refresh toggled off. Speaking with TechCrunch, a Facebook spokesperson confirmed the company's awareness of the bug and promised a fix would be in place "soon." 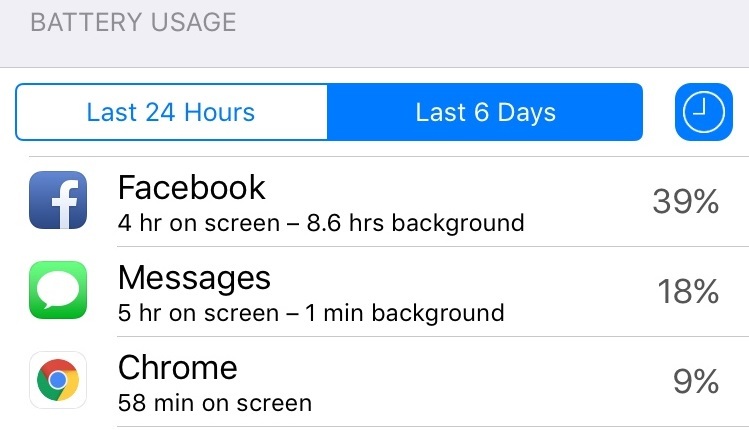 A number of Facebook users have commented on the issue of background battery drain over the past week, with users on the MacRumors Forums posting about the issue as far back as last Thursday. One poster (seen above) saw Facebook responsible for a dramatic 39 percent battery usage over a six day period, despite having background app refresh set to off. Several sites have attempted to theorize on the cause behind the overzealous battery drain, including MacStories, hypothesizing that the reason behind the bug could be silent audio emanating from the service's auto-playing videos. Since most people don't bother with turning off auto-play, Facebook could be keeping a muted audio track running in the background with users largely unaware, letting it run and "consume energy to perform background tasks" even after leaving the app. The company itself hasn't commented on the source of the bug, but at least those affected can look forward to a fix for it in the future. More like "Facebook app finally publicly exposed to be crap, company promises to fix". Leave Facebook. It's the best thing you will ever do. I've been thinking of deleting my Facebook profile. All people use FB for is to brag about what they just bought or where they're going. Basically, who has the bigger wallet. And we'll never know when the battery issues are fixed because their release notes tell us absolutely nothing about what's been changed or fixed with each update. Who's looking at Facebook for 4 hours? Facebook is best used on Safari in iOS. The app is always bad news. I dropped the app two years ago, and it's awesome. They are just addressing this now. Facebook and Messenger have always been battery hogs. It's about time they rewrote this app to not trick iOS into thinking it's an VoIP. That's the issue. I uninstalled it a couple of weeks back and won't install it until they fix this. Turn off background app refresh. One of the first things I do on a new iPhone. My battery life has increased a noticeable amount since deleting my Facebook account and the app. I tried Snapchat for a while and it was also a terrible drain--also with background activity.